Last week I covered the new partnership between Onshape and Magic Leap with a 3D design app for Onshape’s spatial computing initiative. The new CAD app is being developed for the Magic Leap One Creator Edition, a lightweight, wearable computer and headset for a unique mixed reality user experience. It seems that Magic Leap’s focus with LeapCon was software over hardware. Given that the platform is in need of content, that’s probably a good idea. All of this might be OK for developers (such as Onshape) and early adopters, but I don’t think it’s very consumer-friendly at this point for reasons I’ll discuss below. Having thought it over, I think healthy skepticism seems appropriate at this juncture. As great as it initially sounded, I reflected on exactly what was meant by the announcement because it’s such a new development platform and few details were provided. With that in mind, I contacted Onshape about any enlightenment they could provide about the announcement. Can you provide any details on what the app will actually do? Onshape: The vision is that this app will extend Onshape’s full capabilities to the Magic Leap platform, just like we have with our iOS and Android mobile apps for phones and tablets. This will NOT be a simple CAD-viewing tool. When this app is released, engineers will be able to model and edit within the Magic Leap mixed-reality universe – and collaborate with their design and manufacturing teams, and outside partners, just like they currently do with Onshape. Onshape: We have not announced a release date. Jon Hirschtick’s presentation at Leap Con was an industry preview of the app and the first public announcement of the Onshape-Magic Leap partnership, which has been in stealth mode for many months. What will the app be called? Approximately what will the app cost? Onshape: This app is still in development and there has been no announcement about cost. How does Onshape envision the app working for multi-party collaboration? Onshape: Collaboration through the “Onshape for Magic Leap” app would work exactly the same way as collaboration works with Onshape currently. Every member of a team would instantly see design changes in real time as they are made. The only difference is that Onshape users would be able to their life-size models in a richer, more immersive environment than they do on the flat screens of their laptops, phones, or tablets. How about a public demonstration on how this all works? Any public demonstration will depend on our development cycle, which isn’t public. So there you have it from the source. While my questions cleared up a couple things, I thought about the bigger picture and the implications of the partnership. Needless to say, Onshape was not the only technology demonstrated at last week’s conference. In fact, the demonstrations were all over the place, ranging from Star Wars to porgs to controlling in-home devices, such as speakers and lamps. Of course, if you buy in, you’ll have to lay down $2,295 for the privilege of wearing the computer and headset. Any way you look at it, that’s a lot of money for a product still in its early stages. Although corporations could afford this, much as the CAVE walls of the past, I don’t see this as affordable and accessible enough for the masses yet. The announcement that Onshape made last week with Magic Leap does indeed mark a real advancement for product design on what could be regarded as a new development platform that combines mixed reality and CAD. Onshape has been at the forefront of cloud-based design, but the announcement shows that they may really be on to something that truly sets them apart in a space that is becoming increasingly crowded with “me-toos,” but that remains to be seen. Honestly, though, at this stage of development and price point, I’d consider the Magic Leap device experimental and out of step with reality (pardon the play on words). However, done right, this technology and those that will will follow, the possibilities for mixed reality experiences are almost endless. Of course the company says that the technology could be used for just about everything, but from what I’ve seen, read, and heard, there is still a long way to go. Onshape, developer of a 3D cloud-based CAD system also called Onshape, is partnering with Magic Leap on a new 3D product design app for its spatial computing initiative. The new CAD app is being developed for the Magic Leap One Creator Edition, a lightweight, wearable computer that lets digital content step out of the screen and into the real world for a unique user experience. streamed its keynote addresses at www.magicleap.com/LEAPcon. Is FeatureScript One of Onshape’s Best Features? Almost all of today’s CAD products are pretty capable right out of the box, but I’ve often wanted them to do more to suit my particular needs and workflow. Over the years I’ve created macros and used Visual Basic and AutoLISP for defining, customizing, and automating functions and processes not found in CAD products out of the box. My results varied widely – some were good, some were OK, and some were downright unpredictable and bad. Several years passed and I didn’t really do too much with CAD programming, so my interest waned. That all changed, though, when cloud-based Onshape’s FeatureScript came along earlier this summer. FeatureScript is a programming language designed by Onshape for building and working with 3D parametric models. The language is built into Onshape and provides the foundation of Part Studio modeling, including geometric references, parametric tools, and a type system with types built for math in three dimensions. The standard feature types in Onshape, such as Extrude, Fillet, and Helix are already written as FeatureScript functions. Using FeatureScript, custom feature types extend this same function mechanism to Onshape. Is FeatureScript the first specific programming language to be released for a CAD product? No, not exactly, but it is unique in many ways and adds to Onshape’s positive differentiation in the crowded CAD marketplace. 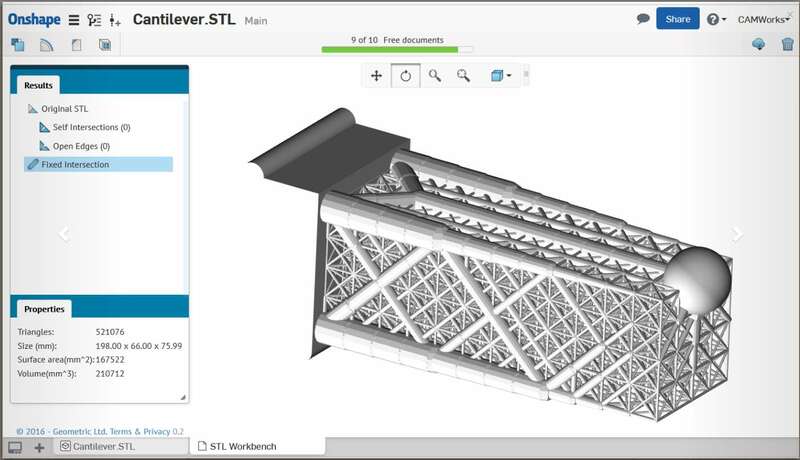 With all the fanfare that took place a couple years ago with the launch of cloud-based Onshape, we thought we’d weigh in with partner Geometric’s announcement of its STL Workshop. Onshape is by no means the first cloud-based/mobile CAD application. It was and still is, however, a unique true cloud-based technology and not a desktop/cloud hybrid. Onshape began with what was one of the best and worst kept secrets in the engineering software arena. Worst, because even early on, it was evident that the technology would be cloud based, even if virtually no details were disclosed. Best, because virtually no details were disclosed, and that just added to the anticipation for the official launch of Onshape. One of the inherent advantages that Onshape has always had is the fact that it was created from scratch by a team used to creating things from scratch with no legacy baggage to overcome and work around. Of course, the development team has not done everything themselves, because Onshape includes software components from Siemens PLM (Parasolid; ironically the same modeling kernel used by SolidWorks) and D-Cubed. This component licensing has let the Onshape team focus its efforts on what it does best. As a first-year Denver Math Fellow (I assist math teachers and tutor in small groups), last week I was give a reprieve from my daily grind of lesson plans and teaching by participating in what my school calls Explore Week. This is a week where I was partnered with a teacher, chose a topic to explore with students, made a video promoting our explore class, and had students sign up to join us. The topic my teaching partner and I decided on was “Creating Furniture Using Non-Traditional Methods and Materials.” Our course included designing and creating furniture models from cardboard, as well as 3D printing simple models. It was a lot of fun, and as I said, a nice change of pace, not to mention I really felt I was in my comfort zone. Today, Onshape for Android, claimed to be the first 3D CAD system to run on Android phones and tablets, was released. The new mobile release comes just five months after the launch of Onshape Beta, a full-cloud 3D CAD system that lets design teams simultaneously work together on the same model using a web browser, phone, or tablet. This is big news because, as far as I know, Onshape for Android is the first 3D CAD app that lets you create designs on Android platforms, whereas other CAD companies have only a viewer. 3D CAD users are no longer restricted to one primary workstation, as their data is now readily available on practically any device. In addition to Android, Onshape also runs on iPhones and iPads – and in a web browser on Mac, Windows, and Linux. Keep in mind, though, the mobile app is not intended to replace Onshape’s use on desktops and laptops – it is meant to expand a CAD user’s access to their work outside the home or office. Onshape for Android is available now for free in the Google Play store. As much as I have tried to resist the temptation to gush all over myself, I’ve had a tough time restraining my enthusiasm for the myriad cloud-based computing and storage options that have come online in the recent past and their potential. OK, it’s time for a reality check – facts, fallacies, myths, and risks. 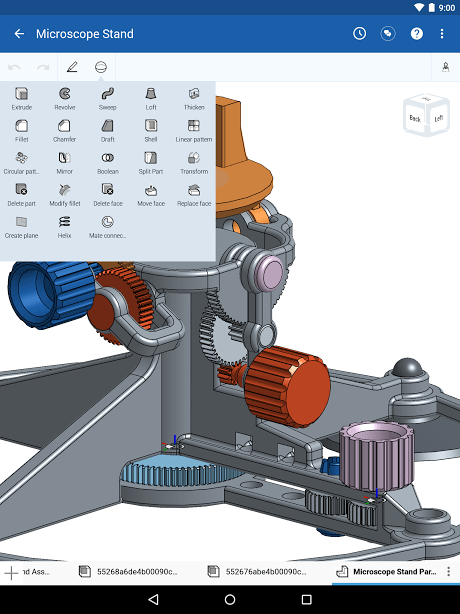 A couple of weeks ago I blogged about a newcomer on the block, Onshape entitled Onshape: The Day After a New Dawn For 3D CAD. Keep in mind, though, that Onshape is online only and always requires a Web connection to be functional. With connectivity so universally ubiquitous, this shouldn’t pose a problem for a majority of prospective users. At this time, the company has no plans for making Onshape available offfline, so if this is an issue or concern, then Onshape may not be a design tool for you. However, that said, I’d encourage you to check out Onshape. Admittedly, this is not an exhaustive list, and is not meant to be. I just wanted to provide some of the cloud-based tools currently available. I also realize that the above have different features and capabilities, so it’s not an “apples to apples” comparison. While the following video is a few years old, and some of the technologies discussed have been superseded or retired, it provides a good overview for novices of what cloud computing is about.